This galaxy is an isolated member of the Ursa Major Cluster of galaxies in the Virgo supercluster. This galaxy has an estimated mass of 125 billion times the mass of the Sun and includes about 290 ± 80 globular clusters. The Owl Nebula is a planetary nebula located approximately 2,030 light years away in the constellation Ursa Major. 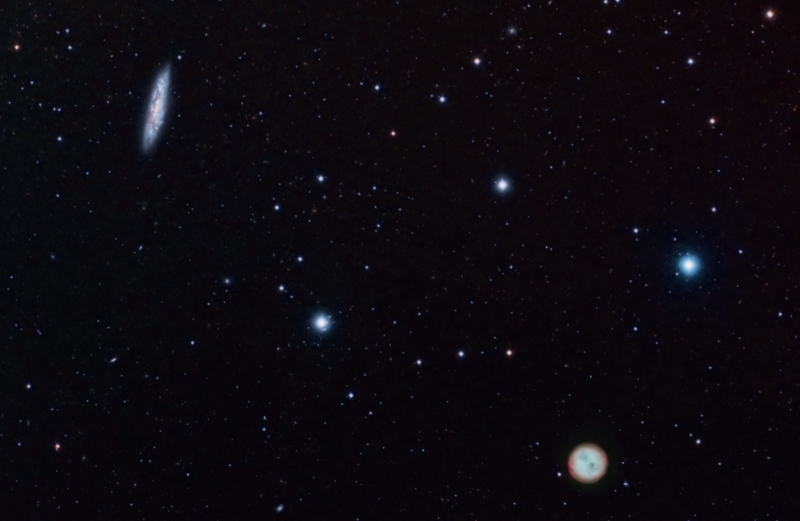 This object is known by the catalogue identifiers Messier Object 97 (M97) and NGC 3587. It was discovered by French astronomer Pierre Méchain on February 16, 1781. When William Parsons, 3rd Earl of Rosse observed the nebula in 1848, his hand-drawn illustration resembled an owl's head. It has been known as the owl nebula ever since.The nebula is approximately 8,000 years old. It is approximately circular in cross-section with a little visible internal structure. Filters: Ha 12nm, Astronomik OIII 12nm, Astronomik RGB 2"